Julie Smart holds a PhD in curriculum and instruction and is currently a professor of math and science education at Clemson University. She is also a consultant in research methodology and program accreditation with a focus on inquiry-based instruction, teacher effectiveness, and classroom management. Smart resides in Greenville, SC, with her husband and two children. 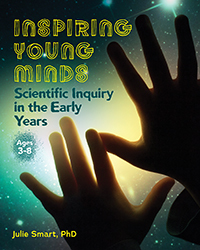 Learn to use inquiry-based practice to inspire young minds through science. This book gives educators a solid guide for using research-based principles of inquiry to help children explore their world. With real-life examples and information on facilitating and guiding children, you will be able to engage and maximize STEM learning.